The Oak Knoll Animal Hospital team of skilled veterinarians welcomes you to our practice. We proudly serve the Moline area. At Oak Knoll Animal Hospital, it is our daily privilege to provide quality vet care to your cherished pet, with compassion and competence. We hope to ensure a positive impact on our patients, pet owners and the local community. Dr. Lundeen came to Oak Knoll in February 2015. Having previously worked in the Chicago Suburbs, she says she chose this field because she has always enjoyed science and medicine. When our previous owner chose to retire in April 2016, she assumed the role of Managing Veterinarian and is excited for the new challenges this role will bring. Her favorite part of working at Oak Knoll is the relationships she has been able to build with our patients and their owners, as well as our staff. Described as hard-working, kind and optimistic – her caring nature has gained her a substantial client base in her short time here. She seeks to continue to grow our practice and provide a gold standard of care and high quality medicine. Outside the hospital, Dr. Lundeen spends time with her husband, Daniel, and their two daughters. Kate and Audrey. If she’s not enjoying ice cream or listening to country music, she can be found unwinding with a good book. She says her biggest accomplishment in life has been becoming a mother and a veterinarian. Dr. Clinton has been with Oak Knoll since 2014. 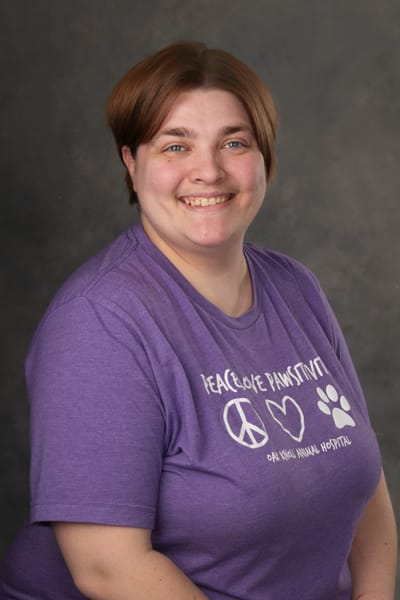 She chose the veterinary field because she has always loved animals and says her favorite part about working in this industry is the constant wealth of new things to learn about. 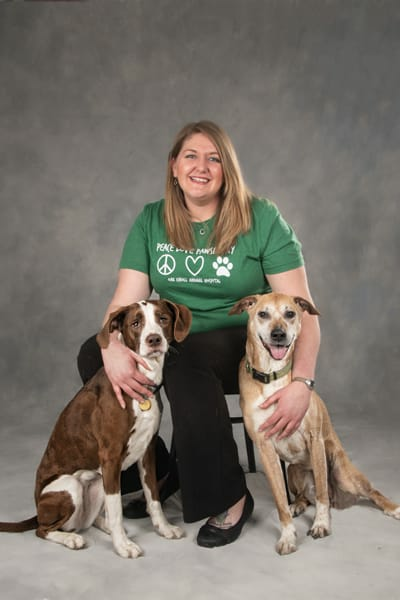 Dr. Clinton enjoys the interactions she has with her clients and our staff, getting to know our furry patients. She wishes that more pet owners knew how important it is to maintain their pet(s) at a healthy weight and keep them properly vaccinated throughout the course of their lives. Her best advice to new pet owners is to work with them everyday to train good manners. In her free time, Dr. Clinton appreciates a rousing game of tennis or a good book. She also enjoys board games and says that her favorite sweet treat is cookies and cream ice cream. She is most proud of obtaining her Doctorate and says that her cat, Bear, is her biggest fan because she feeds him. Dr. Trammell launched her career with Oak Knoll in the summer of 2018. As a recent graduate of Iowa State, she was looking for a workplace she could call home and build long term relationships with her co-workers and clients. She says that she always knew she wanted to be a veterinarian and enjoys the lifelong learning that this industry offers. 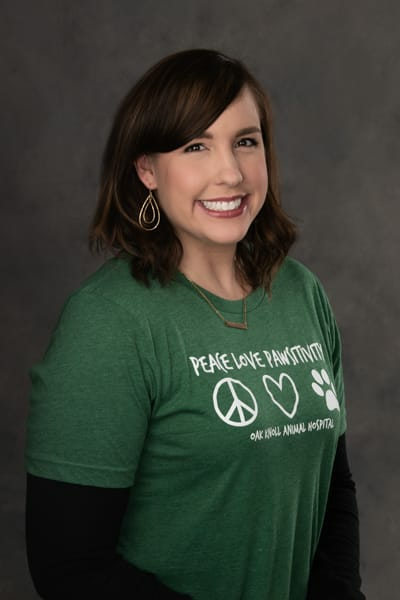 Dr. Trammell is interested in soft tissue surgeries and practicing high-quality medicine, and she says she wishes more owners knew about the dangerous foods, plants and substances in our homes that can be hazardous to pets.